Connect your non-EPS power supply to an EPS motherboard.. 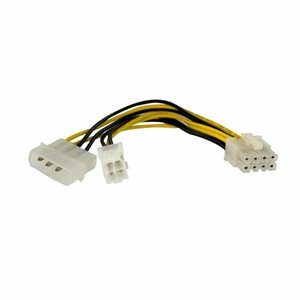 This reliable EPS adapter combines a P4 power supply connection with an LP4 power supply connection, into a single 8-pin EPS motherboard connector, allowing you to use a non-EPS power supply with a motherboard that requires an EPS power connection. The LP4 + P4 PSU to EPS adapter is backed by StarTech.com's Lifetime Warranty.